Believe it or not, in celebration of their 10th Anniversary Packt Publishing is making the e-version of my book available for only $10. Well actually they’re doing it for all of their e-books and videos. This opportunity runs through July 5th, 2014 .. Don’t miss it!! If you’re looking to get started understanding Xamarin, checkout this Free Webcast on Xamarin that I just did for Pluralsight. Packt is celebrating the release of their 2,000th title and has a special offer! 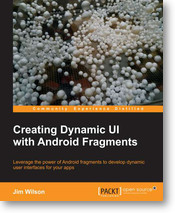 Packt is throwing in a free eBook of your choice with the purchase of my book, Creating Dynamic UI with Android Fragments. Whatever titles you choose, it’s a great deal!! Recently my Google Glass arrived … Needless to say, I was excited and ready to start working on building apps for Glass. I unbox and fire up Glass, go through the initial setup steps, and turn on debug (Settings -> Device Info -> Turn on debug). So far, so good. 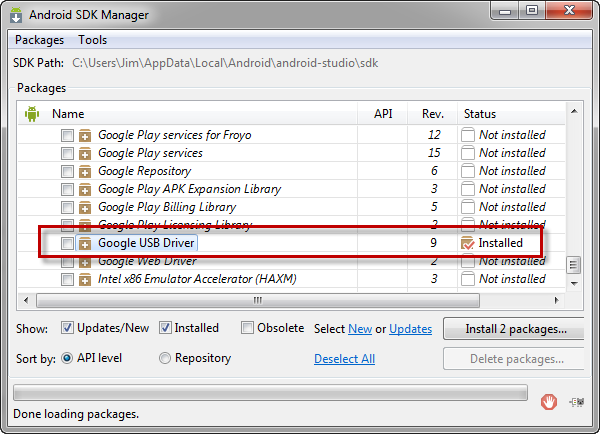 I then walk over to my PC, fire up the Android SDK manager to confirm that I have the latest revision of the Google USB Driver (Rev. 9 at the time of this writing). I then connect Google Glass to my PC’s USB port and wait for the USB setup window to tell me Glass is ready to use. 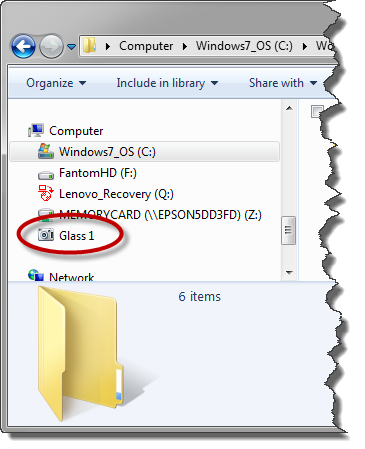 … and Glass 1 is suddenly listed as an option in the Windows File Explorer. 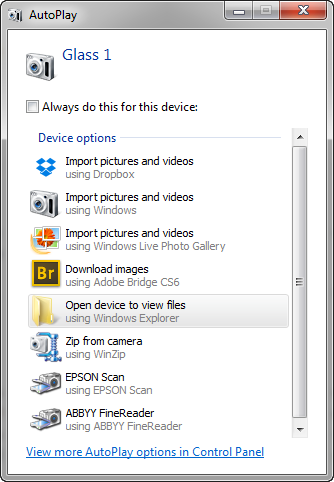 Using both the Auto Play window and File Explorer I’m able to browse around the device file system. I can even copy files between the Glass file system and my PC file system. Feeling confident, I open up a command prompt and enter the command to display the list of Android devices currently connected. Which then displays the following. Notice that no devices are listed. Clearly the USB setup had not completed successfully … there is a problem with the USB driver. If ADB doesn’t see that Glass is attached, tools like Android Studio, Eclipse, DDMS, etc. are not going to see the device either. We need to fix this. For the USB Driver to work with Glass, some tweaks need to be made to the USB driver’s android_winusb.inf file (located in [android sdk install folder]\extras\google\usb_driver ). The list of steps to manually modify the file can be found here. Alternatively, you can download a modified version of the USB driver from AndroidFileHost.com. If you choose to use this download be extremely careful! USE THIS DOWNLOAD AT YOUR OWN RISK!! This is not an official USB installation but rather one created by a person who has been kind enough to share it. I’m using this download on my development PC and it’s working great. That said, you still need to be very careful because there’s always the potential for someone to do something malicious. Once you have the modified USB driver files (whether you manually make the changes or you download them) you can easily update your PC to use the modified USB Driver installation. You’ll probably receive a warning that the USB driver can’t be verified. As long as you’re confident that you’re dealing with a safe driver installation (either you made the changes to the android_winusb.inf file yourself or you’ve validated that the USB driver files you downloaded are safe) allow the installation to run. Once the USB driver installation completes … Your PC is ready to connect to Glass. You can verify that the USB driver change worked by again running the adb command. But this time, you should see a device listed. And now you’re ready to go … time to start creating those killer apps for Glass !! Hopefully Google will soon release a USB driver that supports Glass without requiring these extra steps. But until they do, these steps allow us to begin working with Glass right away. Jim is currently working on an online course for Pluralsight about creating apps for Glass with the Glass Development Kit. That class should be available at the end of April 2014. Remember though that developing native apps for Glass requires a solid understanding of Android app development so checkout Jim’s many Android programming courses and cross-platform iOS/Android programming courses at Pluralsight. Although Fragments have been part of the Android API for nearly three years, I find that developers still often struggle to understand their value and purpose. Fragments group user interface components and their associated logic.